Spacewalker Dmitry Kondratyev installs the Molniya-Gamma experiment on the outside of the Zvezda service module. Oleg Skripochka (slightly out of frame) assists him. Two Russian cosmonauts added new instruments to the hull of the International Space Station today (Feb. 16) – gear designed to track earthquakes, lightning and thunder on Earth. Cosmonauts Dmitry Kondratyev and Oleg Skripochka floated outside of the space station at 8:30 a.m. EST (1330 UTC) and proceeded through a list of tasks that included installing and connecting two new experiments on the outside of the Russian Zvezda service module that will monitor terrestrial lightning, thunder and seismic activity. The spacewalkers successfully completed all of their planned objectives well ahead of schedule, climbing back into the Pirs docking compartment airlock earlier than planned. Russian flight controllers estimated the spacewalk would last about six hours, but at the end of the day, it took four hours and 51 minutes. Kondratyev and Skripochka wore bulky Russian-built Orlan-MK spacesuits equipped with NASA-issue helmet lights and wireless television cameras to beam back live views of their work, when possible. Upgrading the space station with new Earth science experiments formed the bulk of today's spacewalking chores. Kondratyev and Skripochka attached an experiment called Molniya-Gamma, which consists of a trio of sensors, to monitor the gamma-ray signals and visible flashes created by lightning and thunderstorms on Earth. In fact, most of the spacewalk was spent hooking up the slew of cables needed to power the experiment on the station's Russian Zvezda service module. The second science experiment the spacewalkers installed is called Radiometria. It is a Russian tool designed to collect information for earthquake predictions and seismic forecasts on Earth, according to NASA and Russian space officials. About two hours into the spacewalk, an alarm sounded inside the Russian segment of the space station, but it was apparently a false alarm and posed no threat to the astronauts and cosmonauts working inside and outside the station. The cosmonauts wrapped up their spacewalk by retrieving two materials experiment panels from outside of the station's Zarya control module, and tossing an old foot restraint into the depths of space. 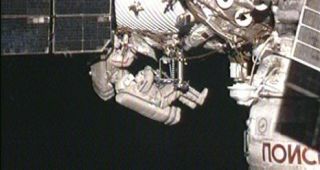 Kondratyev disposed of the defunct foot restraing by carefully jettisoning it into space in a preselected direction to make sure it does not pose a future risk of hitting the space station. "It's like sending a paper airplane into the air," Kondratyev said as he tossed the tool into space. During today's spacewalk, Russian flight controllers had originally intended to deploy a nanosatellite equipped with a small radio transmitter and congratulatory messages commemorating the launch of Yuri Gagarin. Last week, however, officials elected to delay the satellite's deployment until the next scheduled Russian spacewalk, which will occur in late July. Today's outing was Skripochka's third spacewalk and Kondratyev's second. Skripochka has now completed 16 hours and 41 minutes of work outside of the space station, and Kondratyev has amassed 10 hours and 14 minutes of spacewalk time.